Everyone involved with the construction of the park is working flat out to complete the park before our Big Grand Opening on 7th March. The cafe is almost ready to be signed off, the skate park is virtually complete for its first eager skaters and the star of the playground the magnificent dragon is in place. 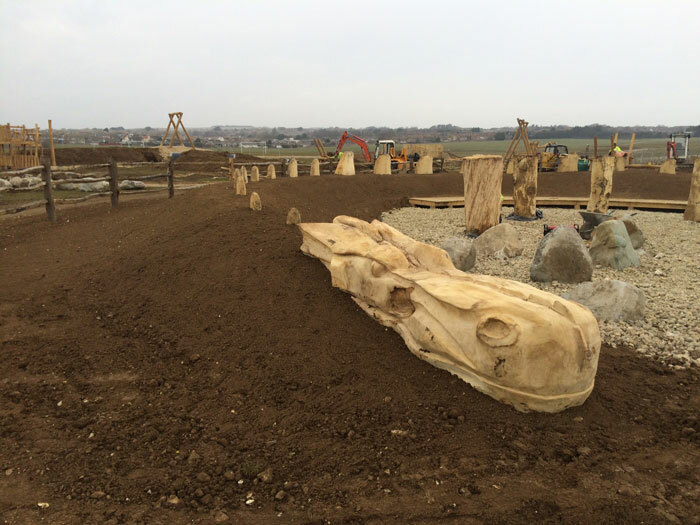 The playground will also boast some handcrafted oak gateways that were commissioned and carved for the Big Park by local artist Keith Pettit. They were inspired by Bronze age rock art and will capture the changing light and weather of the downs beautifully. For more information on the artist and the process of making the gateways visit Keith Pettit’s Blog. We’re pulling out all the stops as the completion date and opening day looms on the horizon. The Peekaboo Wall complete with the stainless steel port holes is now installed. We have also installed the embankment slide and made a start installing the cross members for the balance frame in the Adventure Area. The phenomenal Dragon’s Head carved by Joel the wood carver is now positioned pride of place in the Toddler Area. 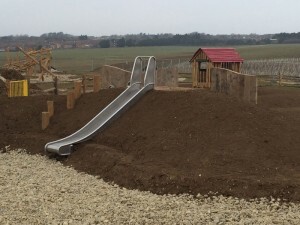 There’s still plenty to do onsite, so next week we’ll be laying turf, continuing the completion of the play equipment, laying safety surfacing and preparing for the landscaping works.